Buy Young's Re-Start Yeast 5g online from our UK Homebrew Shop. We sell Ritchies Re-Start Yeast - 5g sachet and other genuine Young's products in the UK. This Re-Start yeast is sufficient for up to 23 litres (5 gallon) of homemade white or red wine. This yeast has been selected to re-start stuck fermentation. Our UK Homebrew Shop sells real Young's and other Homebrew Chemicals safely online to customers throughout the United Kingdom in England, Wales, Scotland and Northern-Ireland. View more products on the Stirling Homebrew Shop from Young's. Where to buy Young's Re-Start Yeast 5g safely online? 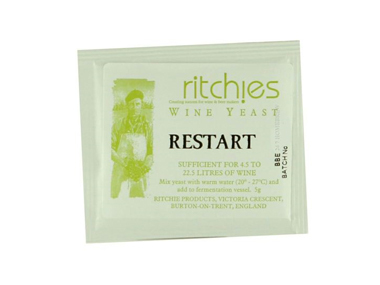 Shop at the Stirling Homebrew Shop if you are wondering where you can buy Ritchies Re-Start Yeast - 5g sachet safely online in the United Kingdom. Our Homebrew Shop is located in the UK and our independent store has been serving customers in England, Wales, Scotland and Northern-Ireland since 1976. You can buy our Homebrew Chemicals online and we post out orders to any UK address. Re-Start Yeast 5g - Ritchies Re-Start Yeast - 5g sachet in Homebrew Chemicals and Homebrew.